How much do I love this Di San Xian? Hmmm……. If I have to choose one my favorite stir-fry dish, it must be the one. But I have to say it’s not very healthy, since it consumes too much oil. 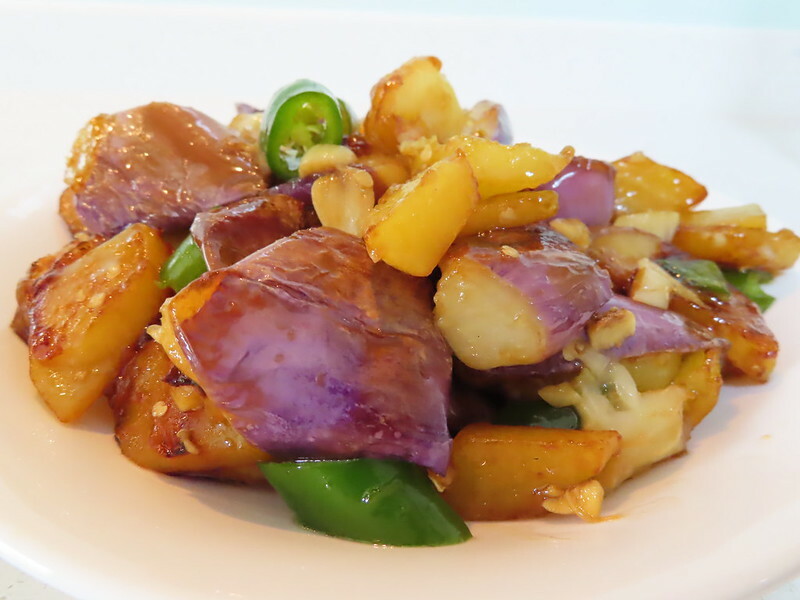 The name Di San Xian (地三鲜）Means 3 fresh vegetables from the earth and which are potato, eggplant and green chili. Heat a pan, add in 1 tablespoon oil. Prepare 2 medium potatoes and chop into slices or small wedges. Fry potato till cooked or the edge turns brownish. Potatoes out. Add in some more oil, 2-3 tablespoon maybe. Eggplant can absorb a lot oil. Fry the eggplant ( chop 1 eggplant into medium chunks). Fry them till they get really softened and cooked. Add potatoes back into the pan. Also add in chopped green chili (You can use bell pepper, but I want to add a little spicy taste to the dish, so I chose green chili). Stir fry for a min or two. Add in 1/2 tsp light soy sauce and 1 tsp sugar. keep stirring and all vegetables will show shiny and brownish color. Chop 3 cloves of garlic and add in. Stir fry to release garlic’s flavor. Season with a little salt. and glaze with a little starch water. Even my husband fell in love with this dish and He is a MEAT LOVER!! !